Audra was the daughter of Richard Anthony (“Deacon”) (No. 6) and Roby (No. 5) Spencer. Audrey abbreviated the word Deacon with the three letters “Dec.” in her reporting. Audrey Mae’s records show that Audra (No. 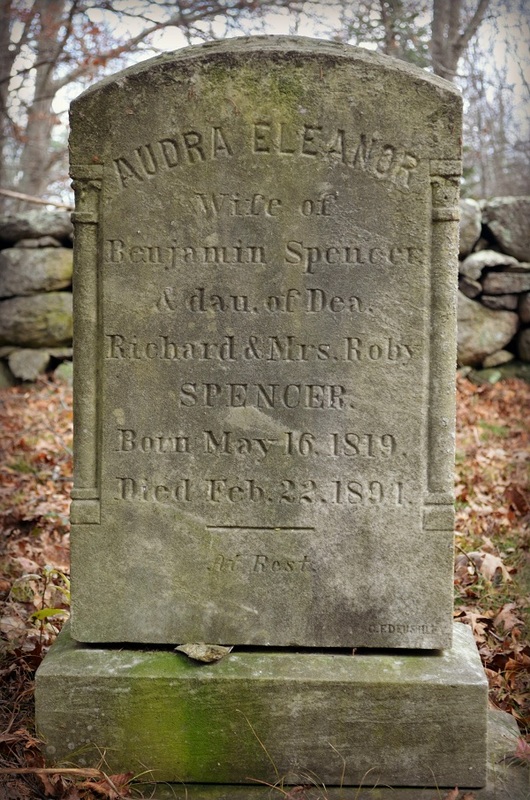 53) was married to Benjamin Spencer (No. 54). 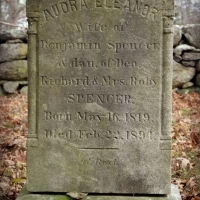 Audra Eleanor and Benjamin Spencer’s grandchildren by daughter Evelyn Spencer are Robert Rathbun (Gravestone No. 55), Alfred V. Rathbun (Gravestone No. 56) and Wilfred Raymond Rathbun (Gravestone No.63) who died as a baby and is related to this line. Although Audrey Mae does not mention this in Roby Alice’s mini-biography, web site author believes that Roby Alice (née Spencer) Rathbun (gravestone No. 48) is also a daughter of Audra Eleanor and Benjamin. Audrey Mae mentions that two Spencer sisters married two Rathbun brothers. The Rathbun brothers’, John’s and George’s, news articles mentions the brothers marrying two daughters, Alice and Evelyn, of Benjamin Spencer. This entry was posted in All Gravestones, Audrey Mae's direct ancestors, Born into the Spencer line, on December 18, 2012 by Heather. No. 38 Frank Evarone, Jr.
No. 41 Deborah Ann Jackson, Jane E.